Webb Simpson is a professional golfer in America who is part of the PGA Tour. He is front and center in the sport considering that he won the U.S Open in 2012 and the Players Championship in 2018. With such an impressive career under his belt, there are certainly a lot of people curious about the details of his life. Below we explore some of those details. Webb Simpson was born as James Frederick Webb Simpson on the 8th of August 1985. His family lived in Raleigh, North Carolina where he was raised along with four older siblings and one younger sibling. His parents are Evander Samuel “Sam” Simpson III and Debbie Webb Simpson. Webb went to high school at Needham B. Broughton where he played high school golf after which he went to the Wake Forest University on an Arnold Palmer scholarship where he was on the golf team. He played the Nationwide Tour and finished twice in second place. His qualification for the PGA Tour came after he tied for seventh at the 2008 PGA Tour Qualifying School. In 2010, together with his friend Mark Bentley, Simpson founded an annual junior golf tournament that is currently called the Webb Simpson Challenge. Mark Bentley continues to serve as the director for the tournament. Webb had two wins in 2011 on the PGA Tour at the Wyndham Championship and at the Deutsche Bank Championship. With those wins, he climbed to second on the Tour’s money list. His life blew up through the game of golf when at the age of 26 years old he won the U.S Open in 2012. It was his first major tournament victory with a score of 1-over par and major past U.S Open winners like Jim Furyk, Tiger Woods and Graeme McDowell were a part of the U.S Open. While he was still an amateur, he was part of the U.S victorious 2007 Walker Cup and the 2007 Palmer Cup teams. Who Is Webb Simpson’s Wife, Taylor Dowd? The golfer seems to be enjoying a happy marriage with his wife Taylor Dowd. At no time was this more apparent than when he made a comeback at The Players Championship and shouted out his wife as being his greatest support. The full story was that Webb had always relied on the anchored putting stroke for his game and then the PGA banned anchored putters. Webb Simpson, therefore, took a hiatus from golf which he used to learn and perfect a new grip style. He was able to win The Players Championship with it and walked hand-in-hand with his wife to go claim the TPC trophy. Taylor Dowd is a Charlotte, North Carolina native and she had been a theatre major in Wake Forest University even before Webb Simpson got in as a young golf star. The two were known by Taylor’s best friend who used to tease them about a possible future together but they did not start a relationship straight out. Instead, Taylor Dowd ran into Simpson’s father at a party organized by her best friend while Webb Simpson was still a freshman. The late Sam Simpson was alleged to have offered Taylor $100 to take his son out. Despite his father’s antics, Webb Simpson only met Taylor Dowd months later and the two became friends prior to exploring a dating relationship. Sam Simpson actually still coughed up the $100 which they spent on their first date. Their love story would be interrupted by hectic schedules and Taylor graduated in 2007 leaving Webb behind in school. They separated then but later reconnected, finding their way back to each other. In five months they were engaged and five months later in January 2010, the two lovebirds got married. 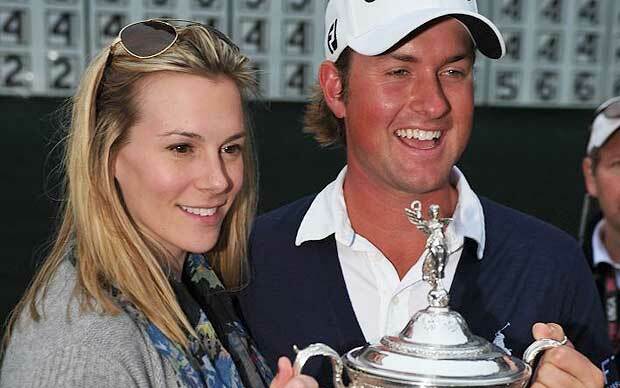 After Webb Simpson got married to Taylor Dowd in 2010, the two made Charlotte their home. In January 2011, they were blessed with a male child who they named James. In 2012, soon after Webb Simpson’s U.S Open win, they had another child, a girl this time, who they named Willow Grace. They had a second daughter soon after who they named Augusta and their youngest child was born in May 2016 and they named her Mercy. Webb Simpson has a recorded net worth of $16 million. The total earnings from his golf career are pegged at $25 million which is understandable considering he got $8 million as a prize for winning the U.S. Open.